What is Gruyère Cheese and where does it come from? Gruyère is a type of Swiss cheese that is named after the town from which it originates, Gruyères in Switzerland. Like a lot of Swiss cheeses it makes for both a good sliced cheese for a cheese board or sandwiches and is also an excellent melting cheese. It has a yellow hue, depending on the producer it can range from a light yellow color to a medium yellow. It is made from whole cow’s milk and traditionally Gruyère is aged/cured for at least six months. To say it correctly it should be pronounced as “groo-YAIR”. What does Gruyère Cheese Taste Like? The longer the aging time the stronger the flavor or more “mature” and intense the cheese tastes. It has a sweeter flavor when young and moves towards a nuttier/salty flavor the longer it is allowed to mature. A young Gruyère is generally 5 months old and is considered mild in flavor. 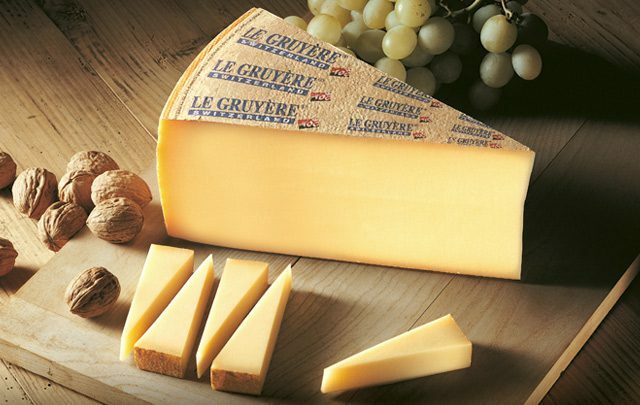 A more mature or a reserve Gruyère is aged for at least 10 months as a minimum. Generally the older and better aged the more expensive it is. It shares some of the general characteristics that you would associate with other Swiss cheeses such as Emmental. Guyère differs slightly from other Swiss cheeses in that it has fewer internal bubbles or “eyes” as they can be sometimes referred to. It is probably best known along with Emmental as the cheese that is used in traditional Fondue recipes. The two cheeses are fairly similar in texture and melting properties which is why the combine so well in a Fondue. However Gruyère cheese is usually smaller in size and has a stronger flavor profile than Emmental. What is Gruyère Cheese like to Cook With? Like all good melting cheeses it has a fairly high moisture content. Generally the higher the water to fat ratio of the finished product the easier it will be to melt. The longer your Gruyère is aged or if you have opened it for a long time since first purchase then the drier it will naturally become. This drying as it ages will affect how well it melts under heat so be sure to take this into consideration especially if you are making fondue. Being such a good melting cheese has been used extensively in grilled cheese sandwiches from New York deli’s and tuna melts at home right back to the Parisian favorite Croque Monsieur or Croque Madame(egg variation) that can be found in virtually every Paris bistro or cafe that serves food. It is also used in French onion soup. If you cannot obtain Gruyère at your local store or have none to hand then there are a number of other cheeses that make a pretty good substitute for Gruyère cheese. If you are on a strict budget then you may find that Gruyère is slightly more expensive than some similar cheeses. Emmental, Comte , Beaufort are all cheeses similar to Gruyère. Emmental is considered the best substitute for Gruyère cheese as it has a very similar flavor and melting properties. As mentioned above it is a slightly weaker tasting cheese and it has much larger eyes or bubbles in its physical structure. From a standard serving of 1 oz(28 grams) expect to find roughly 120 calories in Gruyère. Like most cheese the majority of those calories will come from fat and protein. Salt levels are around 200mg and protein is roughly 9 g. The percentage breakdown is about 71% fat and 29% protein. Where to Buy Gruyère Cheese? These days Gruyère is widely available and almost every medium/large grocery store should stock it. It is also available from online retailers. If you really want to buy the best possible Gruyère then you may need to visit a specialist food store or better yet a dedicated cheese-mongers. The finest Gruyère available is said to be “Le Gruyère AOP Premier Cru” it is so good it won international best cheese a record four times. « Cornmeal Substitute – What can you use?